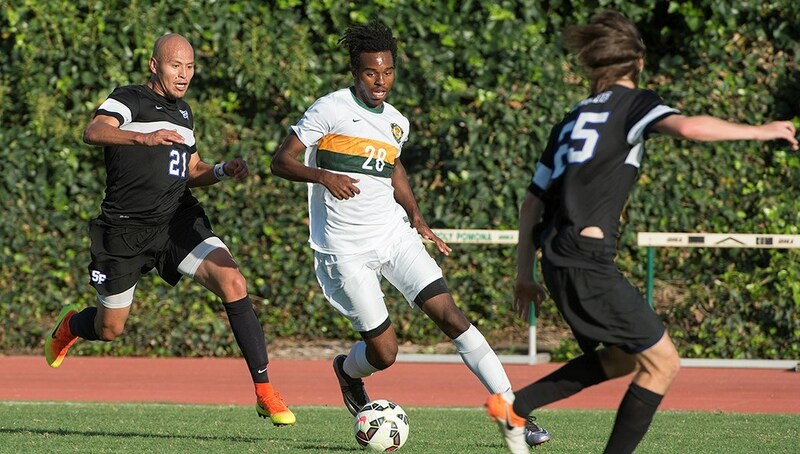 The race for postseason bids is on in collegiate soccer, and both the Cal Poly Pomona men’s and women’s teams are in the hunt. The Broncos will have the added advantage of playing at home with the CCAA Tournament semifinals being played at Kellogg Field. There are six teams in each field. Today’s games will be played at the site of the higher-seeded team with the winners advancing to semifinal play on Friday at Cal Poly Pomona. Title games, in which the automatic NCAA qualifier is decided, are slated for Sunday. On the men’s side Cal Poly is the No. 2 seed behind Cal State Dominguez Hills. The Broncos play at 7 p.m. on Friday against the winner of today’s game between No. 3 Cal State Los Angeles and No. 6 UC San Diego. Today’s other game pits No. 4 Cal State Stanislaus against No. 5 Sonoma State with that winner playing Dminguez. A year ago, the Broncos won the CCAA Tournament and were having a marvelous season at 17-1-2 when the Broncos had to forfeit 11 games, resulting in them not making the postseason. But Raz doesn’t think his team is playing any more determined now after having to sit out that postseason. The Cal Poly Pomona women are seeded No. 5 and will play at UC San Diego at 7 tonight, With a win the Broncos would advance to Friday’s semifinal at home, where they would play top-seeded Sonoma State. 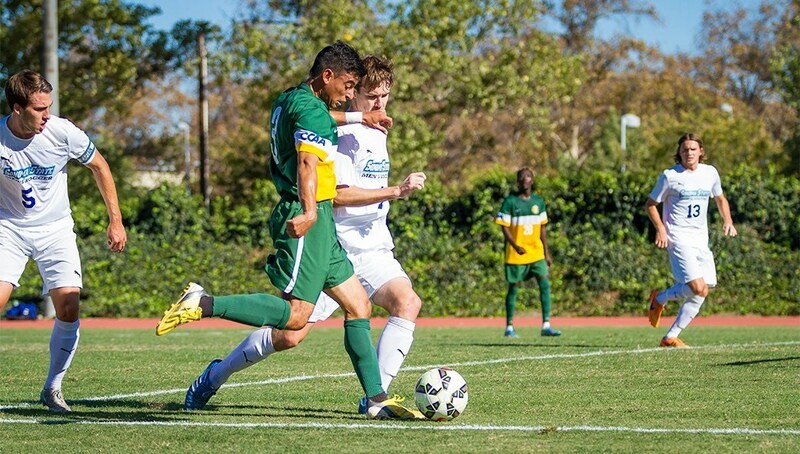 CAL POLY POMONA 5, HUMBOLDT STATE 0 >> Christian Gonzalez Diaz scored two of the Broncos’ five goals in the CCAA shutout victory against the Lumberjacks. Kris Korich had one goal and two assists for the Broncos (10-2-3, 7-2-2). CPP will play at 2 p.m. Saturday against Sonoma State. SONOMA STATE 2, CS SAN BERNARDINO 1 >> After a scoreless first half for the Coyotes (3-9-3, 1-7-3), a second half goal by Diego Mendoza forced the Coyotes and the Seawolves in overtime. It took two overtime periods before the Seawolves (3-9-3, 1-7-3) prevailed as the victor in CCAA play. CS San Bernardino will play at 11:30 a.m. Saturday against Humboldt State. CAL POLY POMONA 2, HUMBOLDT STATE 1 >> The Broncos clinched a spot in the CCAA playoffs after a victory against the Lumberjacks. Daisy Buran scored a goal in the second half off an assist from Tori Tappero. CPP will play at 11:30 a.m. Saturday against Sonoma State. SONOMA STATE 1, CS SAN BERNARDINO 0 >> The Seawolves’ Alex Sifuentes scored the lone goal that proved to be the difference in CCAA play against the Coyotes (4-10-3, 3-7-1). Goalkeeper Emily Whyte had five saves for the Coyotes in the loss. CS San Bernardino will play at 2 p.m.Saturday against Humboldt State.